With our recent publication of PennDOT’s 5-Year Paving Plans for Philadelphia’s suburban counties, BCGP has received many questions about the process. In response, we’ve documented the Frequently Asked Questions, and created a form to propose bike lanes. Please read through the questions before you click on the link at the bottom! What’s going on here? What’s the “5-Year Paving Plan”? Click here for our blog post that gives background. Is this for the Philly region only? What about Berks, Lancaster? What about New Jersey? Yes. Only the counties in PennDOT District 6 are covered by this plan: Bucks, Chester, Delaware, Montgomery and Philadelphia. Philadelphia too? Where do I go to propose a Philly bike lane? Whoa, pump the brakes there. The four suburban counties don’t have a dedicated department like oTIS and a detailed bike/ped plan showing where new bike lanes should be installed. So this plan is specifically for the counties surrounding Philadelphia. The spreadsheets in your blog are hard to decipher. Also, how do I know what project year I should request from? We’re here for you: We created a webmap that shows the projects for 2019 – 2023, separated by county, with simplified project names. Only projects for 2019 and 2020 should be proposed at this time. What if the bike lane I want isn’t on the 5-year paving plan? Short answer is PennDOT won’t be able to accommodate your request in the immediate term. If the road does belong to PennDOT but it’s not on the paving plan, this means that it’s not up for repaving for a while. 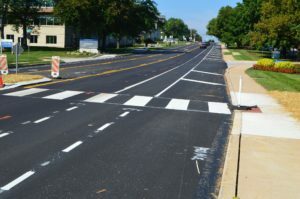 PennDOT is focusing on adding new bike lanes to freshly paved roads to use its resources most efficiently, and also to assure that the markings last as long as possible, as road markings stick best on fresh asphalt. If the road does not belong to PennDOT, it has no control over whether it the road can have a bike lane installed on it. The two other most likely owners of the road are the municipality or county. Ok, the road is not a PennDOT road, but it needs a bike lane. What do I do now? Click here for our blog post about proposing bike lanes on local roads. The road I want a bike lane on is up for repaving in 2019 or 2020. How do I know the road is well suited to having a bike lane added? There are many factors that go into determining if a roadway is suitable for a bike lane. We don’t expect you to be a highway engineer. Go ahead and propose the project, and we’ll see if it can work. Please note that some proposed projects that may be great ideas may not make the cut. PennDOT plans to execute two bike lane projects per county, per year. I proposed my project. What happens now? First, BCGP staff will put your proposal on the webmap on a new layer called “Public Proposals.” Next, we’ll compile a list of the proposals (and note the number that we’ve received per project) and submit them to the “SEPA Suburban Bike Lanes Working Group,” which is a semi-annual meeting of concerned agencies, including BCGP, DVRPC, PennDOT, and the county planning agencies. The Working Group prioritize projects based several criteria, including: suitability of the roadway, connectivity, and municipal support. Yes. PennDOT won’t unilaterally start creating bike lanes in your community without the support of your township/borough administration and the county. Every municipality that the road in question goes through must formally request the bike lane, and agree to maintain the markings and signage. Click here to see how it happened on a specific project in Chester County. Ready to make your proposal? Click here to be directed to our online form, and in the upper right corner of the webmap above to make it full screen.